Talbert Zoo: Household Tasks or Household Responsibilites? Household Tasks or Household Responsibilites? That was the question that I pondered after an interesting conversation with Chris this weekend. I noticed a little tension in our relationship so I asked my husband if we could talk. We had Goose watch the kids downstairs while our uplifting conversation irrupted in the bedroom. It all stemmed from our families of origin. If you have ever been in marriage counseling or pre-marriage counseling you should be familiar with that phrase. Your family of origin is the family that raised you when you were a child. Your experienced within that family shapes who you are as an adult. Chris and I grew up with very different families. Both of our sets of parents were blessed with long and happy marriages and are still happily married today. I am the youngest of five children and was raised in a very strict, traditional Catholic household. Chris is the oldest of two children. His parents did not attend a church on a regular basis, like mine did, although they are Christians. I don't completely understand how Chris's parents ran their household. But I do know that his father has asthma and was unable to take on certain household responsibilities because of it. I also know that all four of them took turns fixing meals for the family. I assume this is why Chris loves to cook. In my family of origin my mother ran the household. She set the rules, was the parent in charge, and made sure everything ran smoothly. She took care of what we would consider feminine household chores. My mother did all of our laundry, cooked about 90 percent of the meals, was in charge of the grocery shopping, cleaned the house, and took care us kids. My dad was her helper and took care of all the masculine chores around our home. My dad mowed the lawn in the spring and summer, raked the leaves in the fall, planted and took care of the vegetable garden and shoveled the snow in the winter. He also fixed anything that broke in our home and took care of our vehicles. I have never seen my mother fill the gas tank of her car. The last time she did that was probably before she met my father. 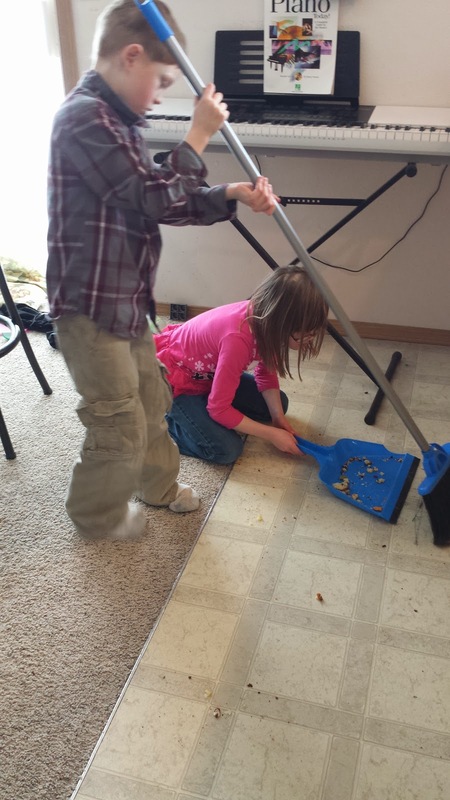 As we grew up all five of us kids were supposed to help out around the house. After dinner we all had a job to do to clean up. As the youngest, I remember I was supposed to put away the clean silverware and put the dirty silverware in the dishwasher. The older kids had different jobs like, sweeping the floor, wiping down the table, clearing the table and loading the dishwasher. On Saturdays we all had what my mother called our Saturday jobs. When all five of us were still living at home all I needed to do was clean and dust my room. The older kids had to keep their rooms clean and do one other job. My oldest brother had to clean the kitchen floor. The second oldest cleaned the big sliding glass door. And my sister had to clean the kids' bathroom. We were taught that these jobs were our responsibilities and we couldn't have any privileges until they were done. Growing up in a large family I learned a lot about the importance of hard work, responsibility and teamwork. I am trying my best to teach my kids the same values that I grew up with. Here at the Talbert Zoo I believe it is my responsibility to take care of the house cleaning, cooking meals, laundry, and parenting my kids. In my opinion these are jobs that the woman of the house should be in charge of. I think my whole concept of this is due to my family of origin. That is how the home of my childhood was ran. I've never, ever mowed a lawn in my entire life. If something breaks in my home I would not have the foggiest idea of how to begin fixing it. My tools of choice are a small hammer, a screw driver, tape and the plunger. If it requires a more complex tool, then I need to look it up. In my opinion the man should be in charge of household repairs, mowing the lawn, fixing things around the home and act as the mothers helper when parenting the kids and other household work. Again, it has to be due to my family of origin. That was exactly my father's role when I grew up. It is so hard for me to get past that. But, Chris does not like to fix things nor does he like mowing the lawn. He believes that taking care of a home is not based on responsibilities. Instead he calls them household tasks that just have to get done. He does not think that there are feminine or masculine tasks. He also believes that we should both be in charge equally in everything that has to be done to run our household. I do not understand this concept. I just can not get past what I learned from my family of origin. I don't think we were able to resolve this conflict within our marriage. Instead we made a list of all the responsibilities or tasks that are needed to run our household. Then we assigned each one to either myself or Chris. After looking over our list we learned that nothing had changed. We are still doing what we have always done.